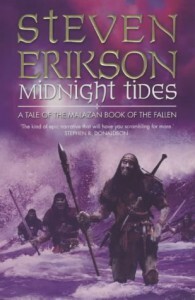 This was the least satisfying of the Malazan books when I first read it 3 years ago. Upon this third read, I like it somewhat better. I still think the slapstick-level of humor got a bit out of hand with the Ublala and Harlest subplots, but I enjoyed the Tehol/Bugg interactions more this time. And I appreciated Trull Sengar's story more this time around, too, especially his interactions with Seren Pedac. Trull vies with Duiker and Tattersail as my favorites characters.